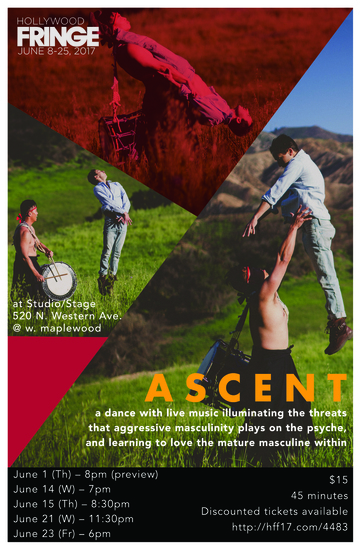 Part concert, part dance-theatre show, ASCENT is a 45-minute low-fi performance taking on the hidden vulnerabilities that men experience within themselves and repurposed as questions that live deep within the performance. Developing gradually over the course of the show, the performers embark on a duet that cycles through impressions of intimacy as if it were the third partner in the piece. ASCENT culminates in two duets of athleticism: one of booming Japanese Taiko drumming and a fragile dance of collisions that impels these individuals to listen beyond their words. ASCENT was developed during the Terra Nova Choreographic Residency, a project of Rosanna Gamson/World Wide with support from the City of Los Angeles Department of Cultural Affairs and the Board of Supervisors through the Los Angeles County Arts Commission.